Integration with everyday use applications like Outlook and Gmail calendar and email is key. Brokers doing any volume of business development send and receive a variety of emails that contain great context on the details of the relationship and where it is headed. Those emails will often lead to meetings being scheduled on calendars. Once those meetings are held, there are notes from the conversations that are had. Absent any intuitive integration with a CRM system, Outlook and/or Gmail represent another island of information that will continue to limit the use and corresponding value of the CRM application over time. AscendixRE converts Salesforce into commercial real estate CRM and uses Salesforce for Outlook and Gmail integrations. In this video, I explain how our Outlook integration works. The Gmail integration works pretty the same. Create new contacts, leads, accounts right in your Outlook or Gmail with AscendixRE CRM. We will automatically prefill the contact details fields for you. One click and your email correspondence will be added to the CRM. No need to switch between your CRM and Outlook/Gmail. You can review all details and interactions there. The successful CRM deployment starts with a measured approach to curating, cleansing and importing data into the CRM system so that it can start working for you day one. Many CRM systems never gain much traction because the broker, while well intended, gets busy and never “finds the time” to input the data into the system. As such, the application provides no initial return and the broker falls back into their old habits. The more information that is input into a CRM system, the greater the potential to leverage that data. In the busy schedules that we all have, it can be challenging to instill good discipline in this regard. While much of this is simply establishing good data entry habits early on, there are configurations around streamlining the forms for data entry that can certainly encourage more data entry. While importing your data into our CRM is pretty straightforward, we offer a free upload help to all users. Once you start your free trial with us, you are eligible for a free upload help. Also, we offer Concierge service for all AscendixRE Enterprise users that is included. Our Concierge team will help you with data entry, creating new tasks, notes, and reports. It is a great time saver. While today’s CRM technologies have become more approachable and easy to use, there is still a need to commit some time to learning the tool early on to establish new habits of data entry. There are quite a few reasons why brokers can’t adopt CRMs. It is important to have clear and tangible business objectives on why you are implementing CRM in the first place as the process of changing old habits can be challenging and may not happen overnight, thus needed plenty of incentive to push through this period. We offer free training sessions and share the CRM best practices regularly. Automate the mundane and repetitive tasks to free up time for more high-value work. There is value in simply centralizing and organizing data that, to date, has haphazardly been stored in various places. Achieving this goal would put you above most in the industry. However, to truly maximize the promise of a CRM solution, set the system up to automate as many repeatable and mundane processes as possible. Examples of this are simple follow-ups to prospects who are qualified but not ready to engage at this point. While well intended, if we don’t automate these types of tasks, they often times are forgotten and never happen. From a listing broker perspective, a great example is setting up a sequence of activities to be scheduled for one or more people upon having won a new listing making sure that all parties are on the same page as to the obligations of the firm for the setting up and marketing of the listing. You can set up the described above and other automated follow-ups in our system. We share the best practices and help you when needed. AscendixRE is highly customizable. Ascendix Search for building lists of prospects, follow up lists, locating your data on maps, mass actions like adding multiple notes at once or creating multiple tasks. Composer to generate various reports and brochures using your CRM data. 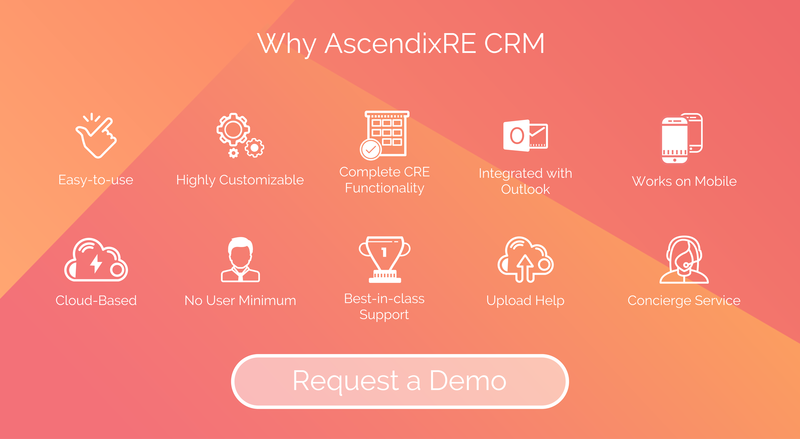 It is possible to integrate our CRM with your property listings website so you can publish and update your web property listings with a click of the button right from AscendixRE. The percentage of time spent out of the office by most brokers is well above 50% for most. Is a CRM solution that is not abundantly available to you while out in the field really set up to support you? You’ve spent a significant amount of time assimilating a virtual brain for your business in the CRM database and it should be accessible to you wherever you are. Basic contact management and scheduling of activities are important but having access to your deal flow, property listings, lease information and notes related to your most important relationships is key. Take it to the next level by kicking off automated workflows from your mobile device so that activities and tasks are happening on your behalf before you get back to the office. AscendixRE has convenient iOS and Android apps. In this video, I showcase how the app works. Begin with the end in mind but crawl before you walk, and walk before you run. Let’s face it, change is hard and is made harder if you try to change too much all at once. To effectively implement change, we must phase it in but while doing so, have clear objectives and business reasons remain visible and socialized so as to persevere through the change management process. Most brokers that we encounter could immediately benefit by simply organizing their company and contact records and making them accessible in and through tools they use on a daily basis like Outlook and mobile devices. Being able to more efficiently stay on top of the most important relationships can give back hours in the day that can be spent on more strategic initiatives and tasks. The most disciplined user of CRM takes the time to “profile” each of the relationships that he/she chooses to track in the system so that they can properly group these relationships down the road for targeted marketing and selling. It is super frustrating to be sitting on a stockpile of viable relationships and not be able to properly sort and filter down to meaningful subsets to communicate specific messages. Not all relationships are the same and need to be interacted with in a way that is personal to truly make a lasting impression. Once having established good and long lasting habits with core contact management, the foundation has been set for advancing into other areas such as deal and pipeline management. Those that have reached a state of maturity should be treated with the proper attention and touched on a different frequency to ensure all the hard work you put into the relationship is capitalized on. Of course, being real estate-centric, the CRM can and should be used for housing valuable market intelligence on properties that you are listing, market listings, lease and sale comps to introduce further efficiency into your work day and to provide invaluable data mining and reporting capabilities that in the past required manual efforts. As I mentioned above, it is quite easy to set up automated workflows, build calling and marketing lists and prioritize your contacts with AscendixRE. Our Client Success Manager is there to help you to tweak your CRM. Nothing starts getting the blood flowing faster in conversations with a group of brokers than the topic of data visibility, who can see what records and when. There is no right or wrong way to go about establishing a security model when deploying CRM. There are certain advantages and disadvantages depending on how it is set up but one thing must be taken into consideration when making these decisions; the corporate culture. If the security model does not reflect the culture of the organization and the users intending to use the tool, you’ve limited the amount of success you can expect to have with the implementation. The good news is that CRM platforms today have some pretty flexible models for setting up security to accommodate most scenarios of data sharing whether it be wide open access to all to locked down individual ownership to somewhere in between. How and what you spend them on is completely up to you. It’s easy to fill your day with tasks and get the sense that you must be making a difference because you have no time left in the day. When you get to a place where more is being asked of you than you have time to devote, it is critical that you start to prioritize those items so that you spend time on the highest value tasks. Couple this prioritization with organizational tools and the automation of mundane or repeatable tasks and you can find yourself operating at a high level of efficiency. As I mentioned above, AscendixRE lets you automate your follow-ups, reminds you about the coming tasks and events. Our add-ons, Ascendix Search and Composer, lets you visualize your data on maps, filter it, and even generate various reports and brochures with a few clicks. Also, our Concierge team will help you with data entry, task management and keeping your calendar up to date (we offer this service free of charge for all AscendixRE Enterprise users). You cannot manage what you cannot measure. You can’t efficiently measure if all you are using are crude tools like spreadsheets and notepads. The most successful people set smart goals, map out a plan to achieve those goals, and then measure progress towards those goals. Working backwards, what are your revenue goals for this year, how many deals will you need to close to achieve that goal, how many deals will you need to be “in on” to close the appropriate deals, how many prospect meetings are needed to get to those deals, and it goes on from there. Without a system that can be dialed in to drive your behaviors for today, this week and next, you will have a hard time getting predictable results for the year. AscendixRE offers advanced Dashboards and Reporting functionality so you can track all key indicators and know what is going on. Our client success manager will share with you our best CRM practices and can recommend the dashboards to set up. Every customer has a buying cycle and while the inner salesperson in us is led to believe we can influence that timing, the truth is there is very little that can be done to change that cycle without compromising the value or margin on the deal. Recognizing this early on helps you to develop a strategy of communication with this prospect that is reflective of timing of their buying cycle and enables you to persist over the course of time in a respectful manner. The persistence part can be challenging if you don’t have discipline, organization and a certain level of automation to help along the way. Think of the farmer who had to plant, fertilize and water his crops before drip irrigation systems were put in place. There was a limit to the crop size he/she could effectively grow before they ran out of time. The same is true of your “sales crops”. Without automation and organization, you tap out at a certain level and a “virtual ceiling” is established on how much business you can generate. What CRM practices are the most useful for you? Did I miss something? Please share your thoughts and feedback in the comments below. 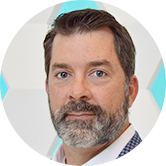 Wes Snow is co-founder and President of Ascendix Technologies based in Dallas, Texas with international offices located in Kharkiv, Ukraine. Ascendix has been enjoyed a successful 22 year existence in the CRM space and is the author of real estate based solutions AscenidxRE and AscendixRE Land. In addition to productivity tools for the Salesforce.com platform like Ascendix Search, Ascendix also provides professional services/consulting for various CRM implementations across the globe.